I am happy to announce that Mikronauts advanced robot controller for the Raspberry Pi is now available! RoboPi stacks on top of the Raspberry Pi with an extra tall stacking header, and adds an eight core 32 bit Parallax Propeller running at 100Mhz to the Raspberry Pi to off-load hard real time I/O from the Pi. RoboPi provides eight 0-5VDC analog inputs, and 24 digital 5V tolerant I/O. 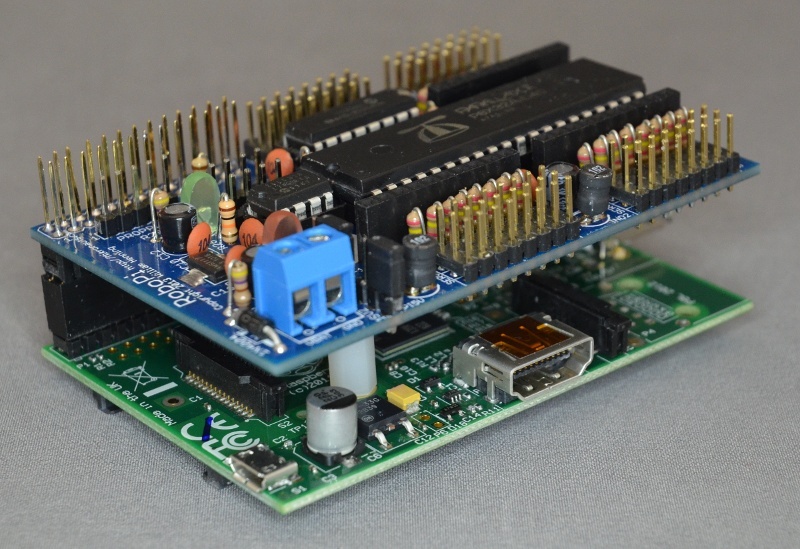 The digital I/O is broken out to three 10 pin female connectors for use with Mikronauts 10 pin modules and/or user modules, as well as three pin servo headers, in groups of eight I/O's. For the first two groups, the user can select between 5V from the Pi or an external battery (for powering the servo headers), for the last group the 5V is from the Raspberry Pi as that bank is intended for sensors or expansion modules. RoboPi also works well as a powerful I/O expander. NOTE: RoboPi is supplied in a kit form in order to be more cost effective for schools, clubs and individuals. Documentation and sample code is currently being completed, and will be released within one week. An assembled and tested SMT version can be made available given orders from distributors. I would be happy to answer any questions you may have about RoboPi. Nice. I've always wanted to like the Propellers more, but doing development on them under Linux seems beyond painful. It needs a download-and-install open source (yes, including all compilers and libraries as open source, not just “freeware”) cross-platform development system. They remind me of the old Transputers: vastly powerful, but understood by few. Actually, developing for the Propeller under Linux is really easy now - SimpleIDE is available for Windows, Mac, and Linux, and runs on the Pi as well, and allows for programming the Propeller in C, C++, Spin and assembly language. scruss wrote: Nice. I've always wanted to like the Propellers more, but doing development on them under Linux seems beyond painful. It needs a download-and-install open source (yes, including all compilers and libraries as open source, not just “freeware”) cross-platform development system. Great work. It would be nice if there was a port of the Processing/Wiring/Arduino language to the Propeller; there's a lot of working code out there that will compile on AVR, MSP430, ARM Cortex, PIC32 and Intel Quark already. There is some Arduino compatibility available (for the base libraries), but no Wiring Processing; however Wiring Processing should be possible on Propeller 2. Mikronauts was meant to play off "astronaut", as in exploring micro controllers, and I deliberately mis-spelled it with a K to make it easier to remember. scruss wrote: Great work. It would be nice if there was a port of the Processing/Wiring/Arduino language to the Propeller; there's a lot of working code out there that will compile on AVR, MSP430, ARM Cortex, PIC32 and Intel Quark already. Last edited by mikronauts on Sun Feb 16, 2014 11:45 pm, edited 1 time in total. Wiring is the Arduino language; Arduino was a straight clone onto cheaper hardware than the Wiring board. Here's Brett Hagman's explanation: How is arduino related to wiring? I know Brett, and he's the designer of the current Wiring S board. I was referring to Processing being a possibility on the upcoming Propeller 2, which will be quite the beast. scruss wrote: Wiring is the Arduino language; Arduino was a straight clone onto cheaper hardware than the Wiring board. Here's Brett Hagman's explanation: How is arduino related to wiring? I know Brett, and he's the designer of the current Wiring S board. Okay, that sounds really neat. Want! The RoboPi Spin API has now been tested! towards the end of the page. - Should I supply a downloadable robopi.eeprom with a propeller-load executable for RoboPi so Pi users don't have to compile the RoboPi.spin packet handler, and RoboPiObj.spin it includes? The API is modelled on Wiring / Arduino in order to be familiar to more users. The RoboPiLib for controlling RoboPi from C/C++ programs running on the Pi is running, and I will publish a PDF in the next few days. It is based on the Spin API, which was based on Wiring/Arduino with the servo library being an integral part of the RoboPi API. The firmware communicates with the Raspberry Pi at 115.2kbps, 8N1 using the Pi's TTL serial port. Raspberry Pi C library for communicating with the firmware on the RoboPi is expected to be posted tomorrow. I've uploaded the "RoboPi User Manual v0.40" to the RoboPi product page. 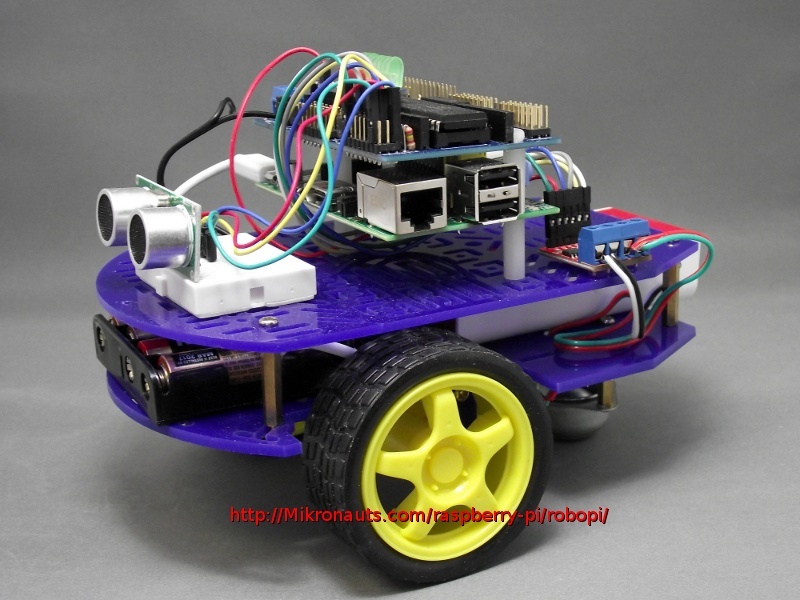 I expect to upload RoboPiLib (the Raspberry Pi C/C++ library for controlling RoboPi) later today. The preliminary user manual has some documentation on the library functions, and it will be updated later this week with more sample code. You need to have the RoboPi firmware installed on RoboPi in order for the library to work. You can find it towards the bottom of the page. This update adds some more sample code, details on PWM, and how to use a Sharp IR distance sensor. There will be a new version of RoboPiLib next week. This will not be supported starting with the next API release, which is expected later this week. You can always use (analogRead(ch)>512) as the equivalent of reading an analog channel as a digital input. Added some information on stand-alone operation, PropPlug warnings and polarity of capacitors in build manual. This is a major improvement from the pervious 6.56us grain, and the improvement is due to eliminating PWM/servo capability for the dedicated serial, I2C and ADC pins on RoboPi shortening the scan cycle. 3) This update will also include readDistance() for at least the inexpensive HC-SR04 sensors. Note the changed syntax from the preliminary syntax in the User Manual - the change was made for consistency with the rest of the API. These changes will be available in the next firmware/API update, which I expect to release before Monday. I just released v0.81 of the RoboPi firmware, object and Raspberry Pi library. readDistance() should also work with the Parallax Ping sensor, and may also work with the SeeedStudio range sensor.